The Banquet of Consequences is being laid out, and so the question is: where will you be seated? The answer depends on two dynamics I’ve mentioned many times: what types of capital you own and the asymmetries of our economy. One set of asymmetries is the result of the system isn’t broken, it’s fixed, i.e. rigged to favor the few at the expense of the many. There are many manifestations of neofeudal asymmetry that divides neatly into two classes and two systems, the nobility and the serfs. A rich kid caught with drugs gets a wrist-slap, a poor kid gets a tenner in the Drug Gulag. Upper-middle class households are tax-donkeys, paying high taxes and getting few deductions, while mega-wealthy corporations and financiers enjoy offshore tax shelters of the kind exposed by the Panama Papers. The stock market operators use high-frequency trading to front-run the market and generate profits that are inaccessible to serfs with retail trading accounts. And so on. Given that the nobility control the machinery of governance (so-called democracy), there’s no way for commoners to influence the neofeudal cartel-state asymmetries short of shutting down the entire system. Which leaves the asymmetries created by the dynamics of the 4th Industrial Revolution in which new technologies and business models are destabilizing every sector of the old economy. The core dynamic here is value flows to what’s scarce and in demand. The asymmetric returns on capital and labor are the direct result of what’s scarce and what’s not scarce and what’s in demand and what’s not in demand. Ordinary labor and college diplomas are not scarce and therefore command very little premium. Ordinary capital is also not scarce, and hence the low yield on ordinary capital. 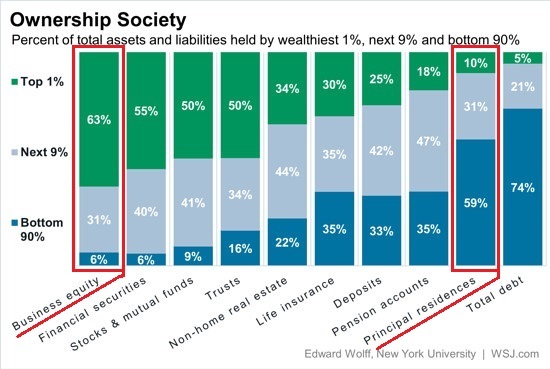 This is why your place at the banquet of consequences will depend on what kinds of capital you own, where you own it and when you own it, the size of your debt burden and the flexibility of your cost basis/structure. Take a house as an example. A house is arguably a limited form of capital as it doesn’t generate an income unless you rent part of it out or conduct a business from home. It’s also very illiquid (costly to sell and the process takes months) and highly sensitive to conditions outside the owners’ control–interest rates, real estate bubbles and downturns, etc. Let’s say the owner encloses the garage and rehabs the space into a rental studio. Now the house is a different form of capital as it has the potential to generate income. Let’s say there are identical houses, one in a white-hot market with high demand for housing and the other in a depressed region losing population and enterprises. In the high-demand region, the studio fetches $1600. In the low demand region, it fetches $400, if the homeowner can find a tenant at all. Let’s say the owner of the house in the high-demand market decides to sell and take the capital gains that result from owning real estate in a high-demand market. Her neighbor hangs on and a year later valuations have declined 25% and buyers are scarce/nonexistent. Where each owner gets seated depends on what kind of capital you own, where you own it and when you own it. As I explain in my book Get a Job, Build a Real Career and Defy a Bewildering Economy, skills, experience and collaborative networks are also forms of capital. But like a house, the skills, experiences and networks can only generate high returns if there is a relative scarcity of these specific forms of capital and there is demand for them. To get a good seat at the banquet of consequences, the owner of capital has to shift his/her capital into scarce forms for which there is demand. This is much easier to manage if the owner of capital has very little debt (and what debt they do have is fixed-rate and long-term), a very low fixed-cost basis/structure, willingness to learn, an appetite for risk and the flexibility to make radical changes to avoid declines in income, capital and control.